Russian criminals knife fighting. Medieval duelists. Eldritch horrors rising. What’s better than that? Stories of horror and madness, tales of the ultimate betrayal. While Emily Webb-Hawkins lies dying of consumption, her husband Wilbur must embark on a jungle quest in hope of discovering an esoteric cure. His journey will take him from the sandy shores of New England to the deepest jungles of the Amazon where he’ll encounter an eldritch nightmare that offers him exactly what it is that he seeks. But will he be willing to pay the price? While Lithe-Wind, a Wampanoag Princess, struggles through the wilds on a crash course with her destiny, a puritanical madman bent on genocide stalks her from afar. And he gains. Amidst the backdrop of an Indian War, will Lithe-Wind achieve her destiny in time to save her people from destruction? After a night of heavy drinking, Alin awakens only to find he’s trapped by honor into a duel with a cruel nobleman. Will Alin swallow his pride and call it off? Will the nobleman accept? When fate conspires against the both of them and only steel can decide, who will walk away? Will either? Join Detective Avinash Shakteel in a rip-roaring descent into darkness as he scours the deepest cesspits of the Machine City in search of a nobleman’s daughter. She’d been taken, but by who? And why? Will Detective Shakteel survive long enough to find the girl? And if he does, will he finally get exactly what’s coming to him? At your fingertips lie seven tales seething with darkness. Seven tales that will transport you to places you never knew existed, places you never knew you wanted to go, places you’ll hunger to return to. 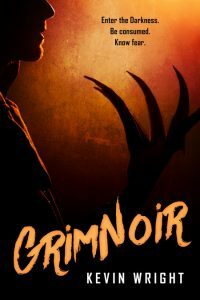 Get GrimNoir by Kevin Wright today!